Not Even a Bag of Sugar: Return from Holiday! I've missed you all, and missed blogging for a week. I have decided that its best not to schedule posts, apart from one or two cheeky ones, and just enjoy the break. So let me tell you about our fabulous holiday. We thought we were going to Lindos in Rhodes. I mean you would, wouldn't you, if your hotel was called Lindos Princess, assume that your hotel was, in fact in Lindos, but no. It was in Lardos, a considerable distance away. But no matter, its only semantics. Because, dear reader, we didn't venture out of our holiday complex. Well I do tell a small lie, Joseph and I went across the road to a shop to buy a truck! We went all inclusive, so that means our flights, transfers, drinks, and meals were all paid for. We had a modest amount of holiday money, half of which went unspent! I only really bought toys for Joseph, as I hadn't taken quite enough to keep him amused (I pack light these days) Our hotel was amazing with several pools, restaurants and even a toddler club. Prior to having a small person to look after, Corey and I were exploratory travellers, just our backpacks, and quite content to wander about, checking out the sights, and staying in hostels and pensiones. With a toddler we find its definitely better to have one base, and to have food and drink on tap. Finding an appropriate place to eat with a hungry, hot, grumpy toddler is not our idea of a good time. We hope once he is a little older, we will return to a our wandering days. Our other complication is we can't do fly drive, which is a total pain in the rear end. I can't drive, and Corey needs an adapted car, which are impossible to source. Holiday lowlight - Joseph's first morning at toddler club. One parent stays with the child whilst they play for an hour. Corey decided it was only fair that I had the hour off. We went together to drop him off, and when I left, boy oh boy, the screaming! He screamed and screamed and screamed, and Joseph was a bit unsettled too. No other way around! Joseph's seperation anxiety is still going max power. But it got better. Poor Corey was completely unprepared for it, I forgot to warn him! Joseph has just started a pre school placement, which I will blog more on in the coming weeks, and we're having a few issues, primarily with dramatic screaming when mummy goes "mummy gooooonnnneeeee" "mummy go away" "mummy come back soooooooon"
Holiday highlight - working on Joseph's fear of the water. There were several pools and Joseph enjoyed both the quieter "adult" pool, and the kids pool, with all the slides and squirty things. He loved skidding down the slides and had a ball with the other kids. His best friends on holiday were Polish, Slovakian and German and it was so fun to see them play and communicate, without worrying about the language barrier. Scariest moment - Joseph has an annoying habit of wandering off. He hopped out of the tiny toddler pool and wandered, I was still in the pool and casually emerged, thinking Joseph was heading towards the ice cream stall. Corey made chase, but due to his disability, he struggles without shoes on. Quick as a whippet, Joseph changed direction to head into the deep end of the adult pool, turned around and shuffled his little body into the pool. He was pursued by a Polish woman and a very tall German man, who, just as Joseph let go from the side, swept him out! Joseph was wearing floats, so I think would have been ok til I got there, but it was scary, and made me realise just how vulnerable we are at times, with Corey's disability and Joseph's stubborn personality. Proudest moment - Joseph did exactly the same thing the next day. But I pre-empted him and over took him. This time he had no floats on. He shimmied into the deep end again, but I had over taken him and was there to meet him, he lept into my arms and we had a lovely swim together with no screaming! We had such a fantastic time, we're going again next year, this time for two weeks. We plan to escape the resort at least twice and see a bit of Rhodes! I'd like to feel guilty that we didn't go anywhere or do anything, but I don't. We needed it! I've just realised I took next to no photos, the reason being is I don't like photos by the pool particularly as its hard to get shots without other kids. I did take a few uninspirational ones on our balcony so apologies for no stunning shorts. You'll just have to make do with these poor ones! 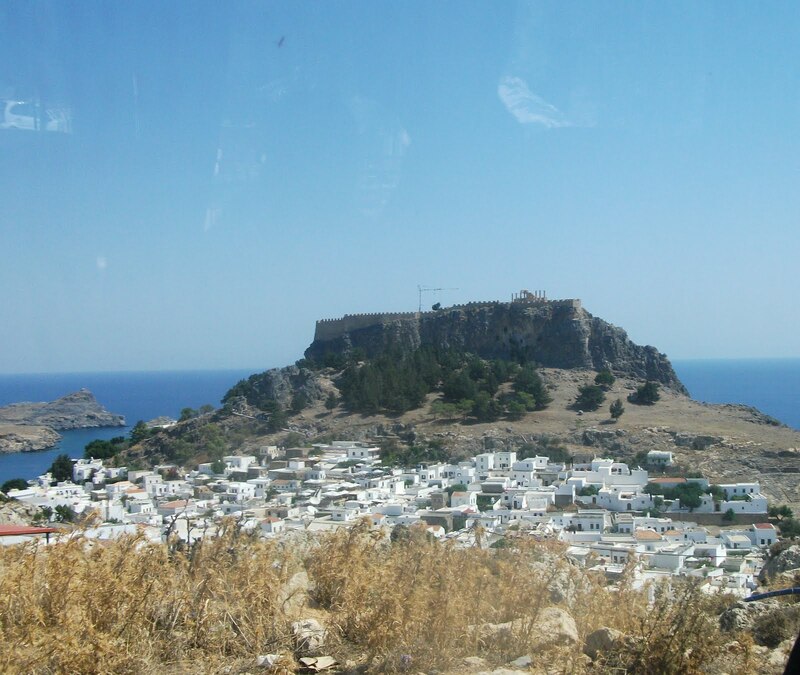 View of Lindos acropolis taken from coach window, complete with smears! A busman's holiday, Joseph on the slide about to flip onto his tummy! Our hotel, view from reception on the way to use the hotel internet cafe!